Season Preview: The Terps are in a prime position to improve from last season and can capitalize on the return of their entire lineup. The Good News: Maryland brings back a very experienced squad that shouldn’t be taken lightly by any of their east coast opponents. Not having any key losses is huge for the Terps as they’ll likely improve upon a slightly down 2017-2018 season. No roster turnover, no leadership turnover, and hopefully a new crop of freshman talent. This had the makings of a big bounceback season for UMD. 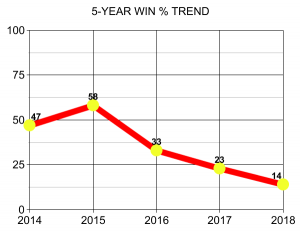 The Bad News: The Terps have been on a downward trend since the 2014-15 season so there’s not a lot indicating they’ll make a dramatic jump this season. The above points in the good news are great, but it still comes down to getting results. Our Call: Maryland certainly isn’t competing for an East Coast championship, but they have potential to be a solid middle of the pack group in their region and the NCDA. If they branch out to more tournaments outside of their area it will help them later on in the year.